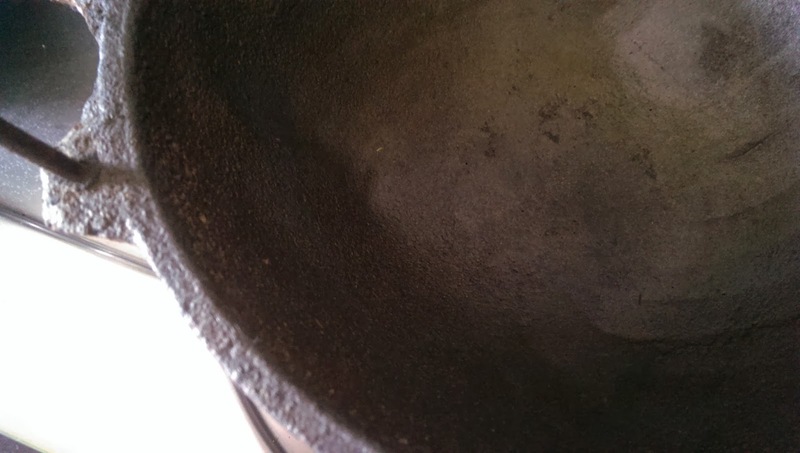 Last year, I had a lot of fun doing this post about Cooking tech : the kind of vessels that it is safe to use in your kitchen. I have replaced a lot of my non-stick vessels with anodised aluminium, and some with cast iron. But now a new factor has entered the picture - induction cooking. In the last year, the market has been flooded with induction stoves, really cheap (some are available at price-offs for under Rs.2000). They are popular with consumers for a variety of reasons - a back up for when you run out of gas, a safe cooking method where naked flame is not allowed, and a light and portable gadget to carry on trips. However, induction stoves work only with compatible cookware - and when I bought an induction top, I realised that manufacturers are making a killing on this front. Non-stick pans with induction base are priced at least at a 30% premium over regular ones, and it's extremely hard to find anodised induction cookware. I imagine that most people will not want to invest in separate cookware only for the induction stove - we would want our vessels to do double duty. Hence this post. As you might know, induction-compatible cookware has to have a magnetic base (it contains iron or iron alloy). Most stainless steel vessels will work with induction stoves too, as they contain iron alloys. Aluminium (including anodised aluminium) is non-magnetic and will not work unless the manufacturer provides the base. So what are the best vessels to invest in for both induction and gas stove? The answer is - iron vessels - either cast iron or carbon steel. All iron vessels are good, but there is a subtle difference between these two types. Let's understand it better. Carbon steel is widely available, slightly cheaper than cast iron and seems to be more popular. It is produced from rolled steel sheets. It is thin and light compared to cast iron but much also stronger and less brittle. Since it is made from steel sheets, it is easy to create different shapes and sizes. Carbon steel will heat up evenly and quickly (which is an advantage over cast iron). The flip side - as it is thin, it may also burn more easily, and requires a little more oil and love during cooking. In my experience, it also needs more patience and skill to complete the seasoning process. I have had carbon steel vessels accumulate rust far more rapidly and persistently than cast iron. This is my comfort zone, and it's what my grandmother has traditionally used for cooking. It will take a longer search to find cast iron vessels and many regular vessel shops will not stock them. 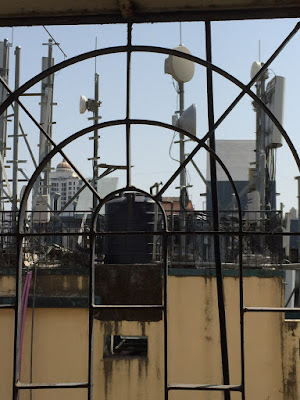 I found mine in Mylapore, Chennai. 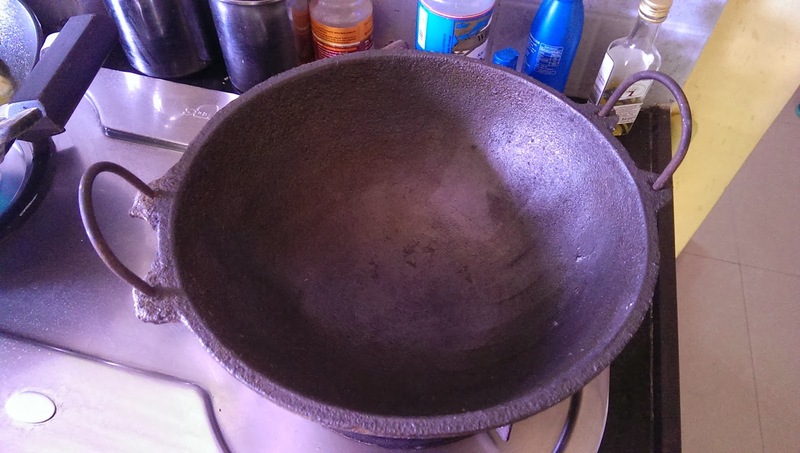 Again, cast iron tavas (flat pans) are easier to find than kadhai's or woks. Cast Iron vessels are produced from smelted iron which is poured into a mould. The resultant vessels are extremely thick and heavy, with a slightly pitted rough surface unlike the smooth surface of carbon steel. Cast iron is also brittle and vessels may break if they are dropped from a height. Cast iron takes longer to heat, but holds heat longer, shortening the cooking process. I love cast iron for the beautiful way that it browns and roasts - I can make better cheese melt sandwiches in my cast iron pan than in any oven! It is also as good as, if not better than, non-stick - you can cook with very little oil and food simply never burns or sticks. So to get back to the point of this post - I recommend a mix of carbon steel and cast iron vessels in the kitchen, for use on induction and gas stoves. Induction stoves require flat-based vessels to work well, and you are likely to find a wider choice of these - saucepans, skillets etc. in carbon steel. Tripolia Market in Jaipur has a great range of reasonably priced carbon steel woks and skillets. You will find the same in any good steel shop across the country. With cast iron cookware, its a little difficult to get choosy because hardly any is available! I have a dosa tava which works well on induction (the lesser the base curves, the better it will work). The kadhai will also work provided that a substantial surface area is in contact with the induction cooker. If you happen to travel to the USA, pick up some Lodge Logic iron ware or if you can afford it, Le Creuset. And if you come across any shops selling good cast iron, let me know and I will update this post. Happy cooking!